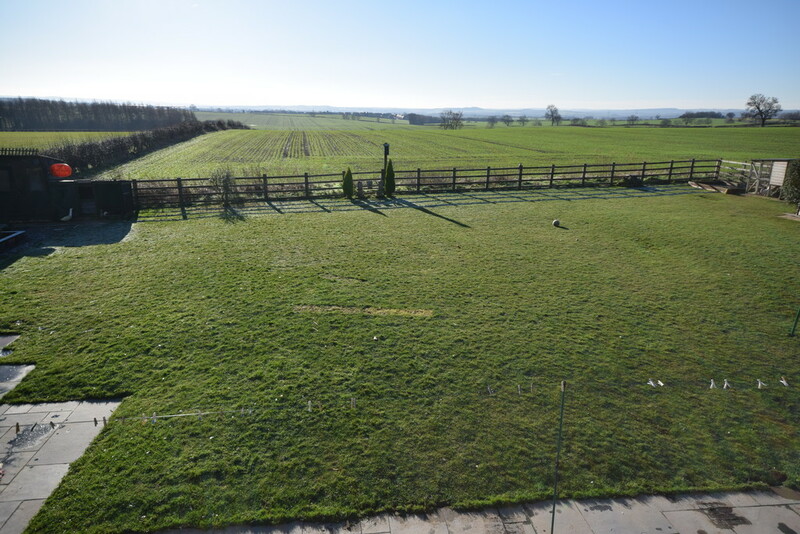 A superbly appointed 4 bedroom detached family home situated within this popular semi rural village of Clayton just outside Hooton Pagnell set within large gardens beautiful commanding views over farmland, numerous outbuildings, double garage with stable and an excellent standard of internal presentation. 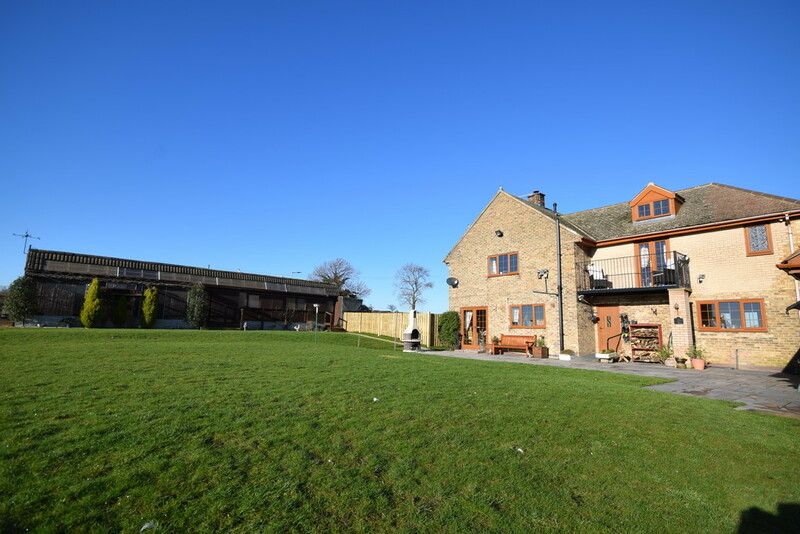 The property has been extended and extensively modernised in recent years to create a beautiful family home that blends traditional oak internal doors, stone mullions, mahogany style UPVC double glazed windows, calor gas central heating, ensuite to the master bedroom with 2 further contemporary family bathroom/shower rooms, balcony from the master bedroom with commanding views over farmland and beyond. The double garage incorporates the stable to the rear and numerous outbuildings could possibly be turned into a handy workshop. 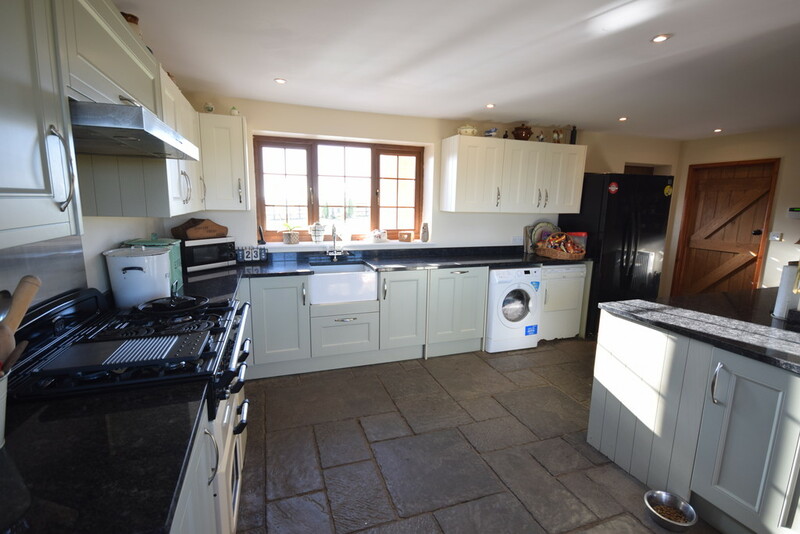 There is an open living kitchen with granite work surfaces, contemporary fittings with an excellent standard of internal presentation. 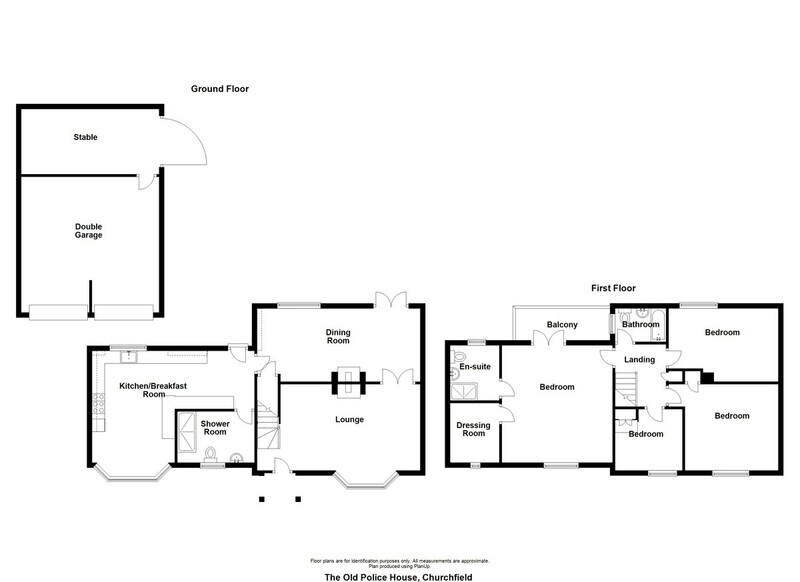 The properties accommodation is certainly worthy of inspection and comprises of a spacious lounge with multi fuel burner, stairs rise to the first floor, double opening doors to the dining room which has Yorkshire Grey flagstone flooring, UPVC doors that open out the patio and gardens beyond and internal door to the kitchen, the living kitchen has a host of shaker style wall and base units with granite worktops, Belfast sink, Rangemaster dual energy oven with stainless steel hood over, modern ground floor shower room, first floor landing, 4 bedrooms, the master bedroom has an ensuite shower room and a superb balcony which appreciates the rear farmland views, modern contemporary family bathroom. 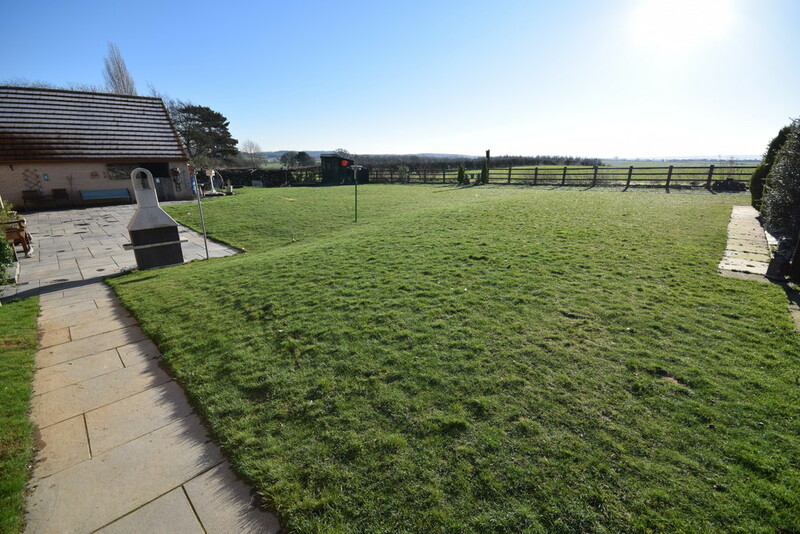 The property lies within the outskirts of this popular semi rural village of Clayton, just outside Hooton Pagnell, standing in superb large gardens. Just before Clayton the property is the second home on the left hand side behind a brick boundary wall with opening gates to a block paved driveway. 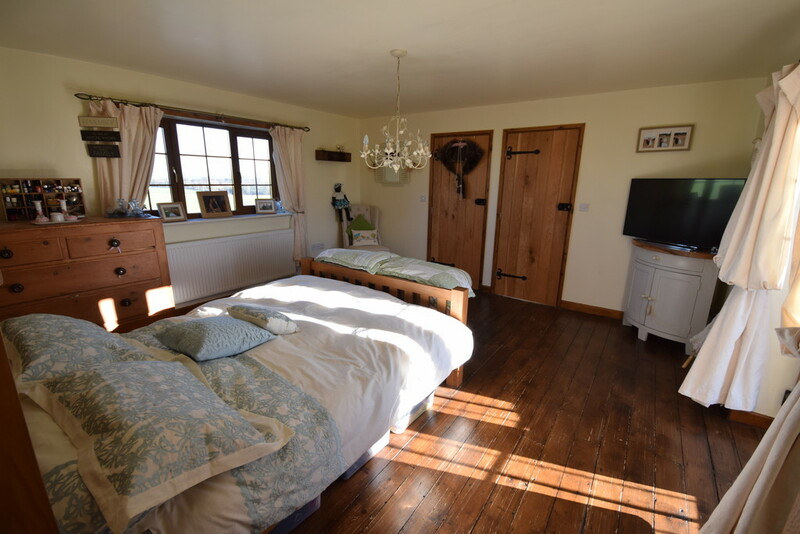 The gardens are predominantly lawned to the front and the double garage has a stable to the rear. Wrought iron gates to the side of the property open to the rear. 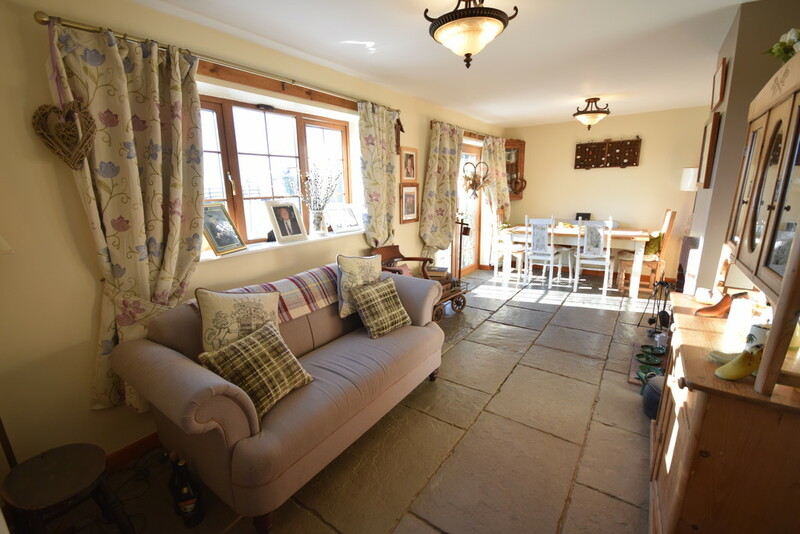 The rear gardens are superb which include a large patio ideal for seating and entertaining. 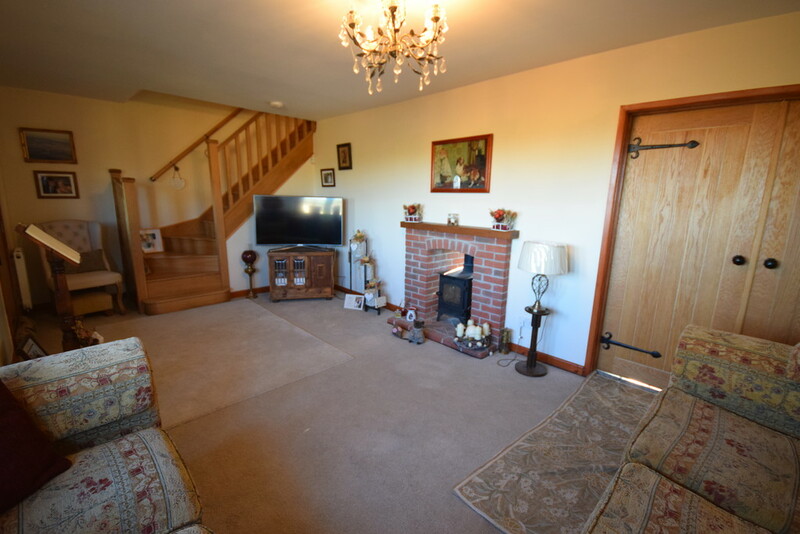 The rest of the gardens are mainly lawned really adding to this great family home. 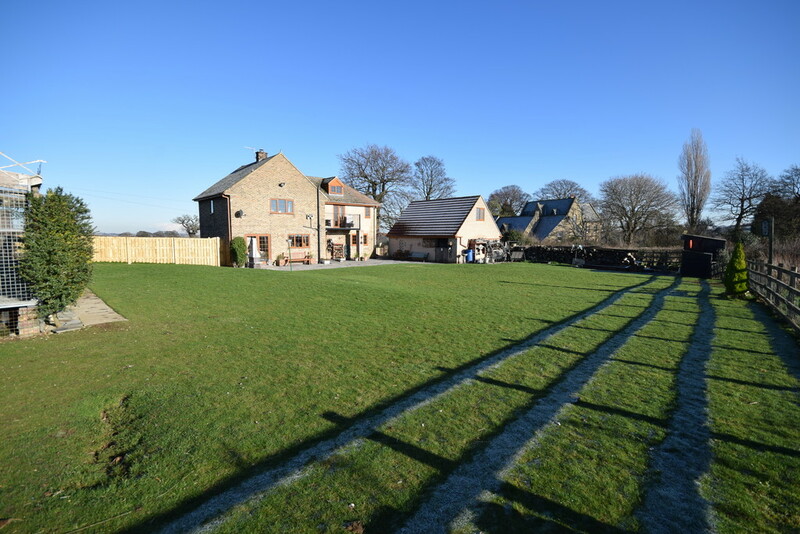 Numerous outbuildings are available which could possibly be converted into a very handy workshop. 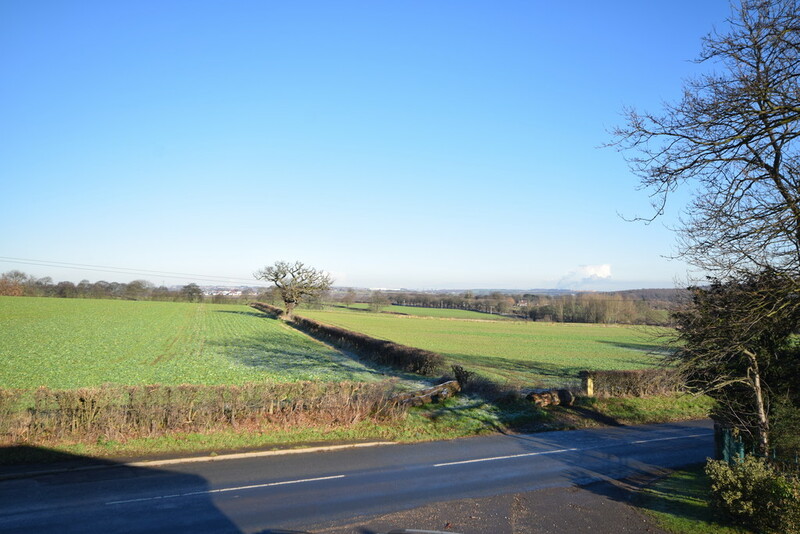 The property commands views to the front and rear elevations which over look farmland and beyond making this a very desirable location. 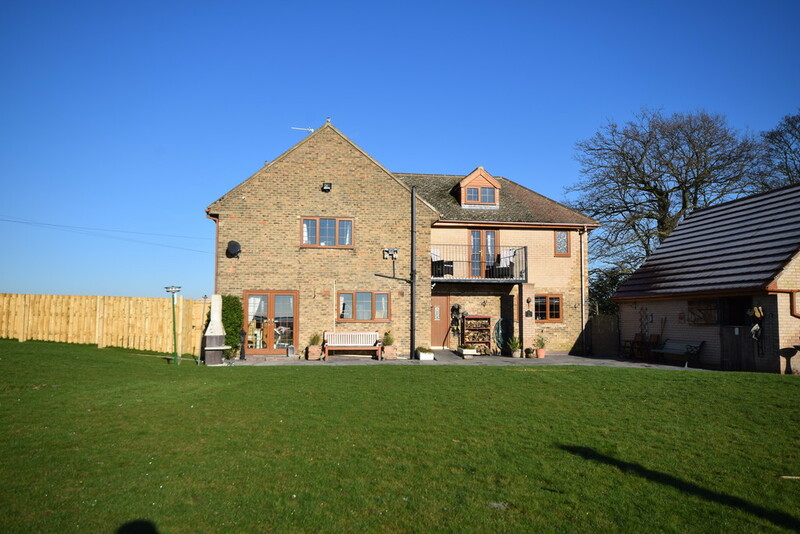 Clayton is a semi rural village just outside of Hooton Pagnell near to Frickley , Hickleton Golf Course and approximately 12 miles from Doncaster town centre. The A1(M) motorway connections can be found at Marr and also at Pickburn. The A1(M) can open up many other commuting network systems. Proceed out Doncaster travelling along the York Road taking your left hand turning onto the B6422 onto Green Lane, proceed through Pickburn and Brodsworth which continues into Hooton Pagnell taking your right hand turning still continuing along the B6422 taking your left hand fork following the signs to Clayton along Clayton Lane. 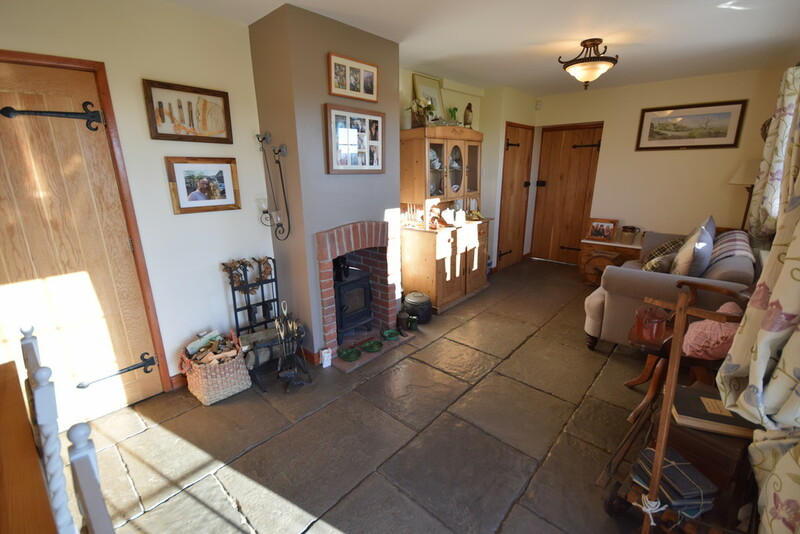 Proceed down Clayton Lane travelling through Hooton Pagnell passing out on the right hand side Frickley Horse trials continue along this road and the property can be situated on the left hand side with a for sale board outside. ACCOMMODATION A modern composite door opens to the lounge. LOUNGE 21' 3" x 10' 9" (6.48m x 3.28m) This eloquent room has a central multi fuel burner set within a brick surround and wooden mantle. The multi fuel burner is intriguing and also supports the dining room. 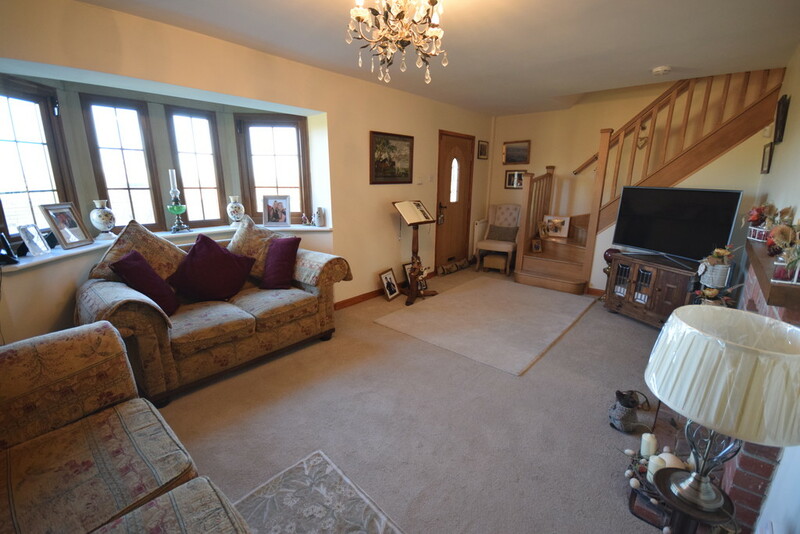 There are oak double opening doors into the dining room, stairs rise to the first floor with balustrade and handrail, tv aerial point, socket points and double glazed mahogany style UPVC bay window that enjoys the commanding front farmland views. 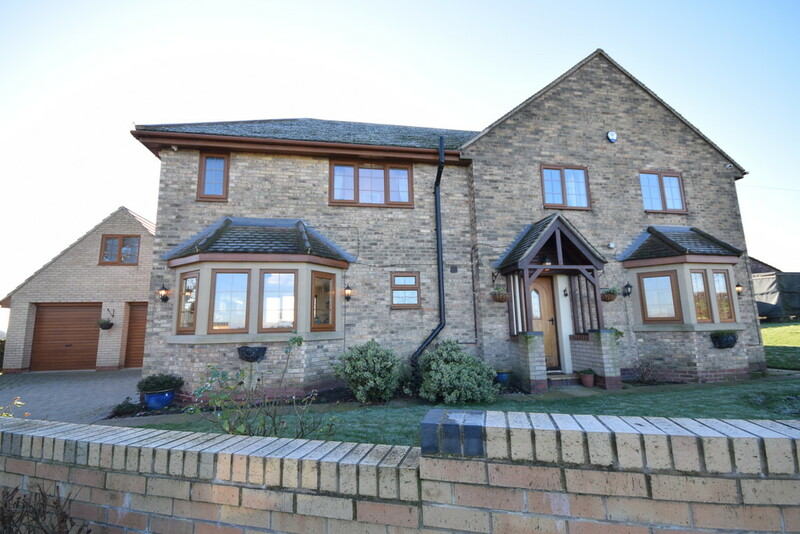 Stone mullions surround the window from the front which adds to this beautiful home. DINING ROOM 31' 3" x 9' 5" (9.53m x 2.87m) The dining room has been fitted blending the traditional and contemporary, the multi fuel stove and Yorkshire Grey flagstone flooring adds to the ambiance of the room. 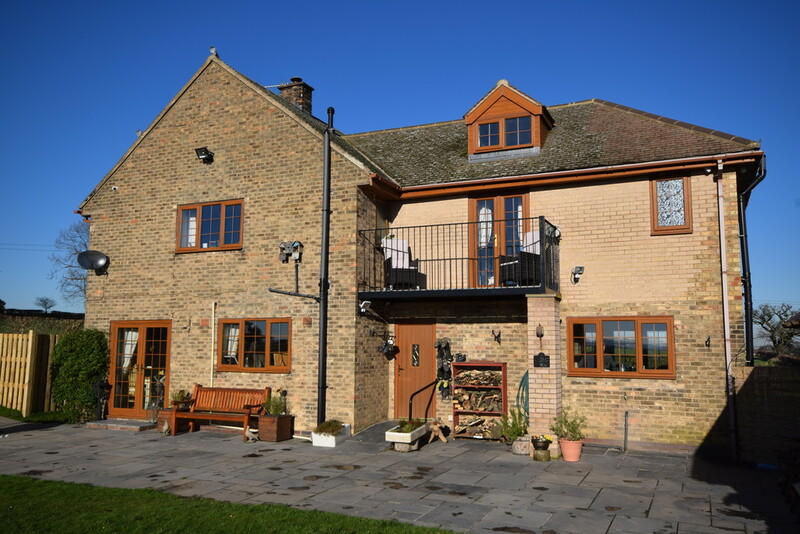 Mahogany style UPVC patio doors open to the gardens and beyond, oak doors into a useful understairs cupboard and also to the breakfast kitchen, further double glazed window to the rear adds an abundance of natural light with an excellent standard of internal presentation. The kitchen is designed with a shaker style fashion with quality granite worktops, Belfast sink, Yorkshire grey flagstone flooring, Rangemaster dual energy oven with stainless steel hood over, downlights to the ceiling, lovely double, glazed window to the front and rear, great seating space for either table and chairs, door opening to the rear gardens and a further door to the modern ground floor shower room. 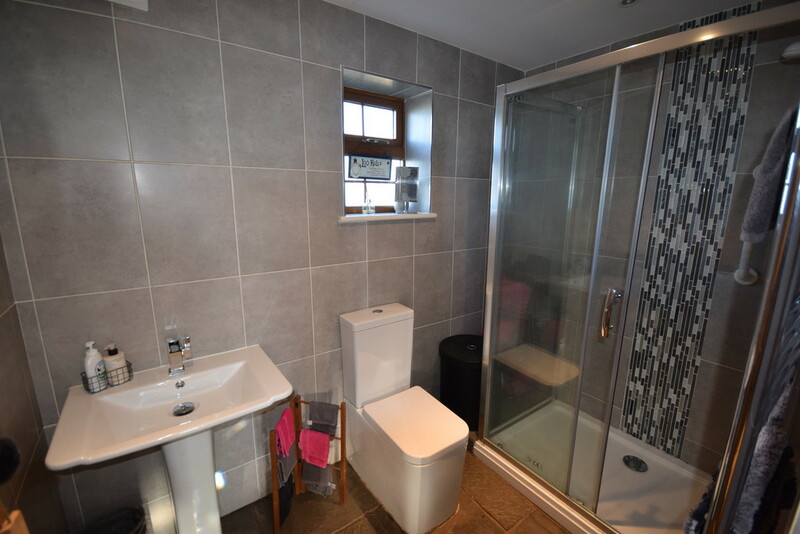 GROUND FLOOR SHOWER ROOM This modern contemporary 3 piece suite has complimentary and stylish tiling to the walls, good size shower cubicle with sliding door, wc, wash hand basin, downlighter, extractor fan. 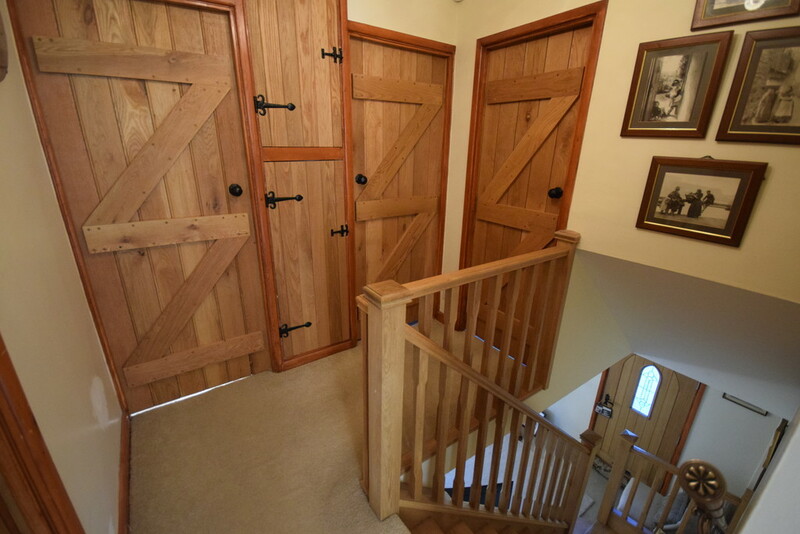 FIRST FLOOR LANDING The landing retains beautiful traditional features including storage space, oak internal doors to the main rooms. 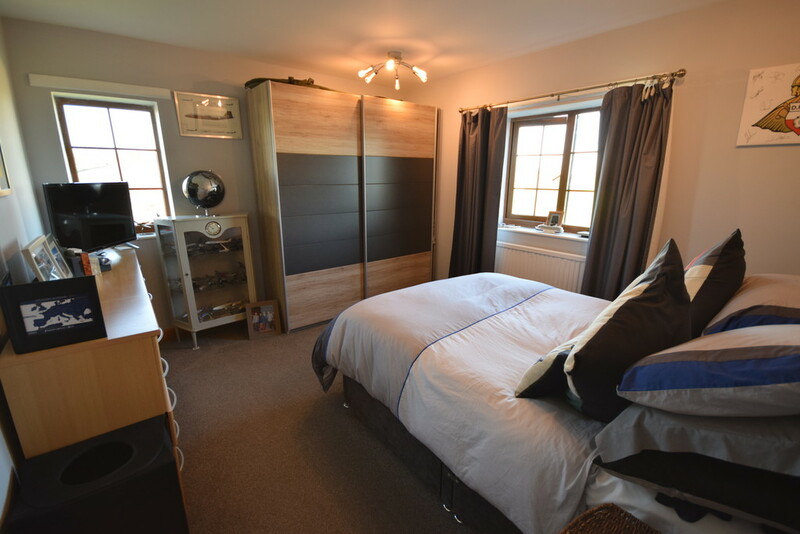 BEDROOM 1 14' 7" x 14' 5" (4.44m x 4.39m) This dual aspect double bedroom is superb as not only is it dual facing but features UPVC doors that open out to the balcony. 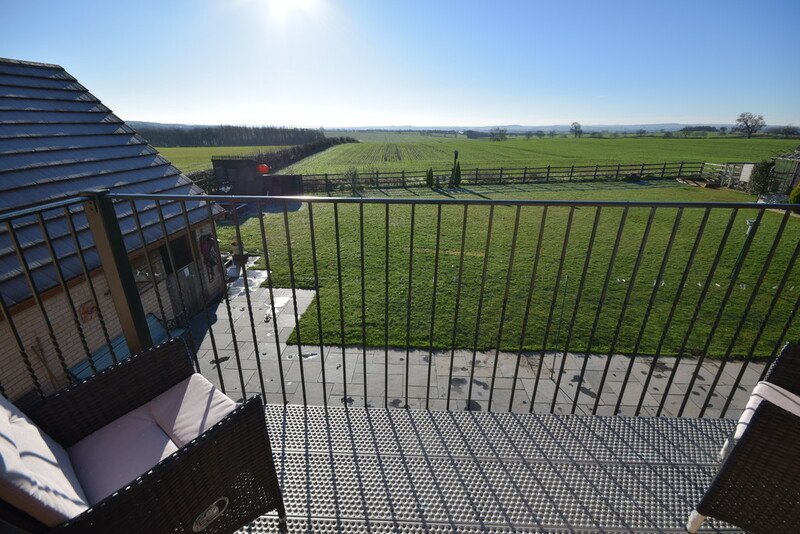 This balcony can only be appreciated when sitting and just looking over the gardens and farmlands. 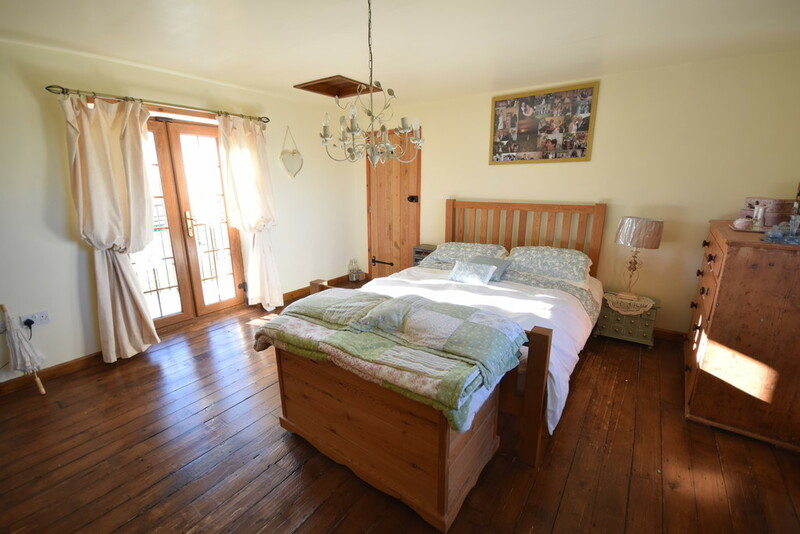 The double bedroom has socket points, radiator, internal door to the ensuite and walk in wardrobe. 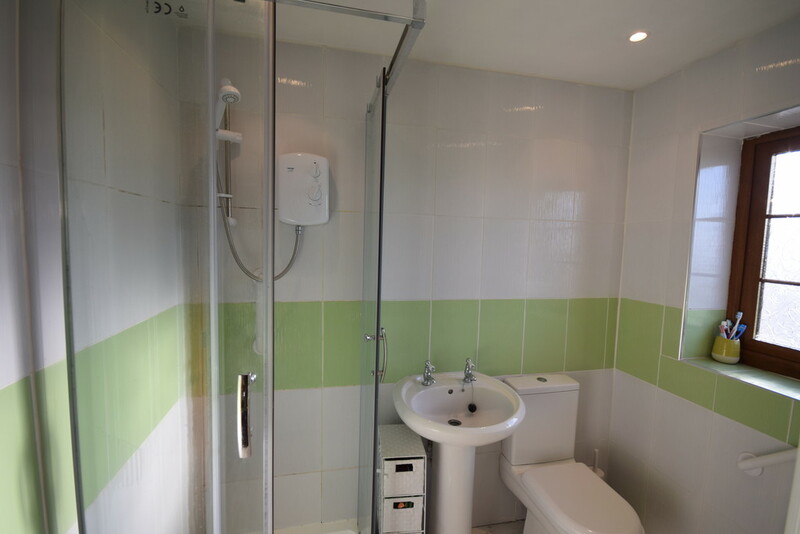 ENSUITE The ensuite maintains a 3 piece suite including a shower cubicle, low flush wc, wash hand basin, coordinating tiling to walls, downlights to the ceiling and a double glazed obscure window to the rear elevation. BEDROOM 2 10' 9" x 12' 3" (3.28m x 3.73m) Another dual aspect bedroom where the views can be appreciated, windows to the side and front elevations, nice standard of internal presentation, radiator, socket points. 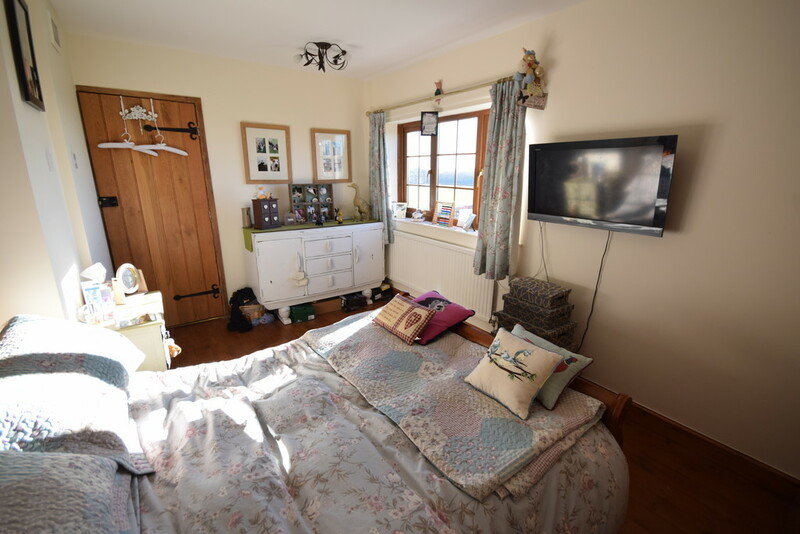 BEDROOM 3 14' 5" x 9' 8" (4.39m x 2.95m) A rear facing double bedroom having a radiator, socket points and nice standard of internal presentation and UPVC double glazed window enjoying the rear views. 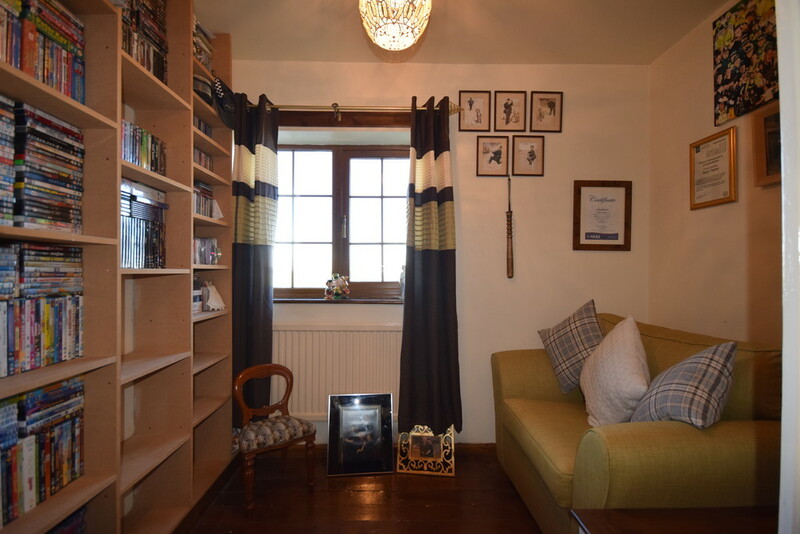 A front facing single bedroom which is currently being used as a sitting room, radiator, double glazed window to the front elevation and fitted book shelving. 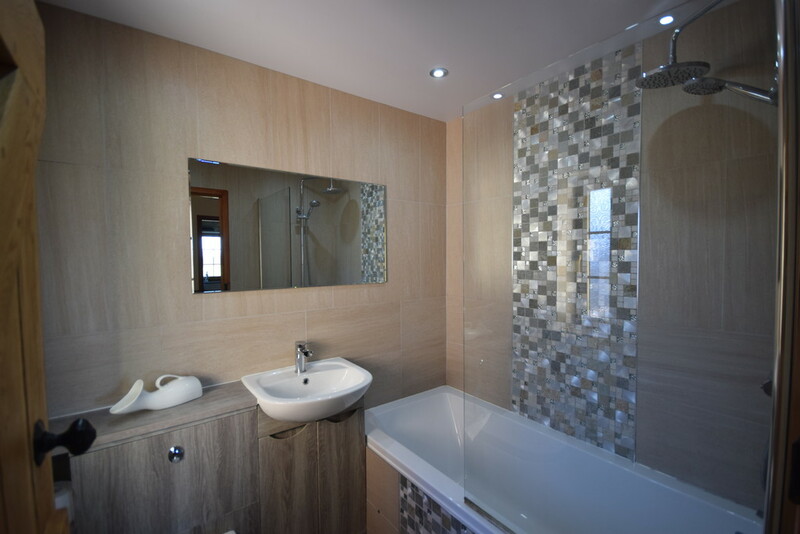 FAMILY BATHROOM This contemporary and stylish 3 piece suite has coordinating tiles to the wall, family bath with chrome shower over and complimentary screen, low flush wc, wash hand basin coordinating with the wc, downlights to the ceiling and very modern and stylish radiator. 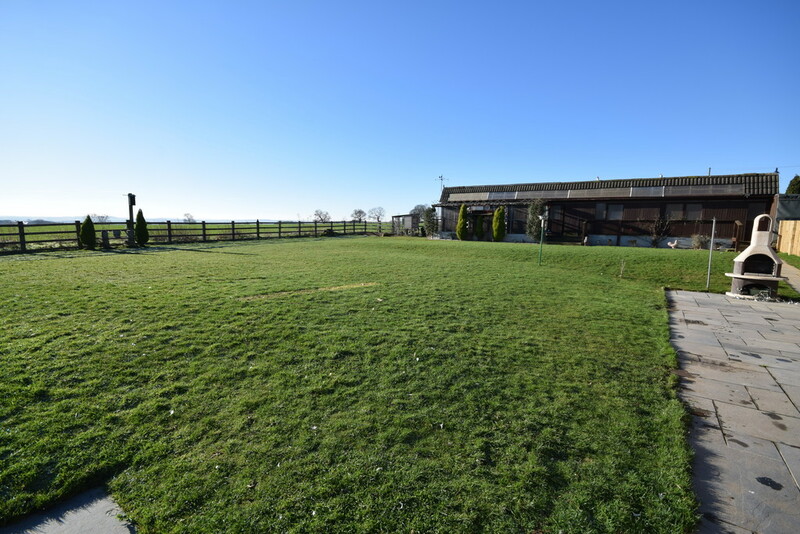 OUTSIDE This good looking property stands just on the outskirts of Clayton with farmland to the front and rear. 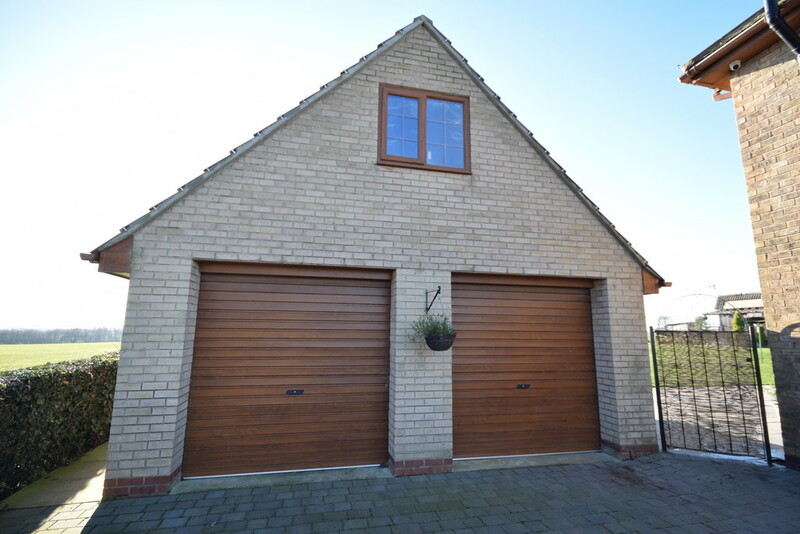 Wooden gate opens to the block paved driveway which provides off road parking space to the double garage. Double garage has a very useful stable to the rear. 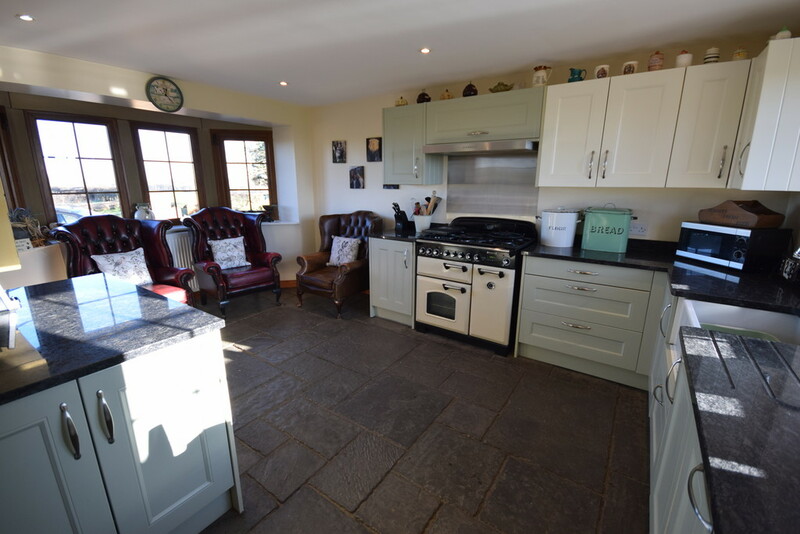 The rear is a large garden which enjoys a paved patio ideal for seating and entertaining , superb large lawned gardens with numerous outbuildings, fenced and railing boundaries all creating this excellent family home. 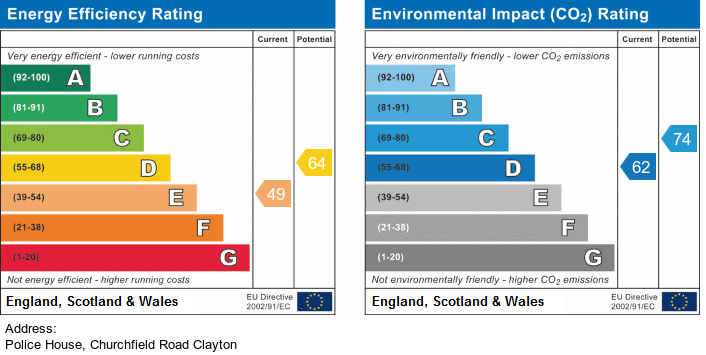 SPECIAL NOTE ; We understand that the drainage is a cesspit, Calor gas provides the heating.